"STAYING IN OUR NATURAL DIYN, BY STAYING ON THE SIRATU AL-MUSTAQIYM"
As Islam (Al-Islam) is the "Diynu Allah (swt)", meaning it is the "Religion" that represents the very laws that Almighty God Allah (swt) has created the whole of creation, including the Physical Universe, by, then all the laws of "Nature" (another term for the Physical Universe) are based on the "Divine Law", which is the Law of the "will of Allah (swt)" made manifest. the "Will of Allah (swt)" is called "Eternal Law" (Jus Aeternae), and the two branches of it are "Divine Law" (Jus Divinicum), and "Natural Law" (Jus Naturae). the Natural Laws are the Laws of all of the "Natural Sciences", including Physics, Chemistry, Mathematics, etc. in Islam (Al-Islam), the study of the Divine Laws, or Higher Laws of Creation, is called "'Irf" (from the root word "A'araf" (meaning "Higher, Elevated, Exalted"), and the study of the Natural Laws of this physical part of creation is called "Ilm" (from the root word "Alam" meaning "Knowledge, Science, Gnosis"). with this understanding, everything that is part of the Physical Universe (called "Nature") and that is following the Laws of Nature (Natural Laws) 100% are considered to be Moslem (Muslim), because they completely submit themselves to the Eternal Law of Allah's (swt) will. it is only that which has been given a "Mind" that can choose to go (rebel) against the Laws set by Almighty God Allah (swt), because along with "Mind" came "Free-Will", giving every Mind the ability to choose. but for every choice there is a consequence, reward or punishment. and so, we as Moslems (Muslimiyn/Muslimuwn) know that all Human Beings are born Moslem (Muslim) as babies, who are 100% acting according to "Natural Law", until Man (mankind/humanity) steps in and begins to teach them other things that go against the Divine Laws and Natural Laws that govern creation. the natural way of life for all Human Beings is Islam (Al-Islam). thus Islam is our Natural Diyn, no matter what race, ethnicity, nation, tribe, or family that we come from. Islam (Al-Islam) is the original and only Human religion, from the First Physical Man that was formed in flesh, until the Last Physical Man that will ever be formed in flesh. so when those of us who were not raised in the religion of Islam (Al-Islam) "converted" to Islam (Al-Islam), we were really reverting (returning) back to our Original True and Divine Religion; Diynu Allah (swt). thus Islam (Al-Islam) is our Natural Diyn, as our Original Diyn. in returning (reverting) to Islam (Al-Islam) you were only returning to your own natural state of existence, being 100% in unification (Accordance) with the will of Allah (swt), the Eternal Law over all creation. and whenever someone is taken out of their Natural Diyn, they are converted to an "unnatural" state, which can continue to do nothing but bring chaos, conflict, confusion and contradiction into their lives, so they leave their Natural "Peace" of their Diyn (Al-Islam) and begin to travel thru the helllish nightmare of the "Dunya", the secular world without Islam (Al-Islam) which is ruled by their lowest physical passions and desires which are not kept within the bounds of righteousness. this is why only someone who is standing on the Siratu Al-Mustaqiym, can ever be considered as a "haniyf" (meaning Upright/Erect, symbolic of Moral Righteousness), like unto Nabiy Ibrahiym (Prophet Abraham, asa). which is why all Moslems (Muslimiyn/Muslimuwn) are warned that whoever forsakes the Religion of Abraham (Millatu Ibrahiym) is a "fool". that "millah" and the Siratu Al-Mustaqiym (straight path to Allah, swt), are one and the same. it is the "Path" (way of life) of all of the Prophets of Allah (swt). the word "fool" means one who has gone "insane", the word "Insane" is from "In+Sanus" which means "Un+Clean" (not sanitary), as their thinking has become "dirty" with unnatural (against the natural laws) and anti-divine (against the divine laws) thinking, like the people of Nabiy Nuh (Noah, asa), whose every "Thought" was "Evil" continually. let me explain a little more, the term Natural represents the Physcial Universe, meaning that which Physically Exist, meaning it is Physically Tangible, meaning it is Physically Real, and so Natural Law is the Law of Physical Reality, when you begin to go against the Natural laws, you begin to go against the laws of Physical Reality, and if your thinking goes against Reality, then it becomes "Unrealistic", and Unrealistic thinking produces Irrational and Unreasonable ideas and actions, and that is "Insanity". you might not like what I am saying, but look at the "Dunya", and tell me what is happening within it is not the actions of Crazy People??? using radioactive nuclear waste to poison the air, land and water that we need to survive. wasting billions of tons of food very year, while people are starving all over the world. people killing each other over colors (red and blue) that they did not create and do not own. inhaling smoke (Carbon Dioxide) with all kinds of added cancerous chemicals on purpose. adults running around sexually molesting our young sons and daughters and calling it a "lifestyle", etc. if that isnt Crazy, then I dont know what is. everything that is "anti-human", or "inhumane", is in abundance in the "Dunya", which is the natural effect of losing your Natural Diyn. the opposite of Light is Darkness, the opposite of Love is hate, the opposite of Life is Death, and the opposite of your Natural Diyn, is the Unnatural Dunya. and being Unnatural it is also not under the Divine Laws, automatically making it Anti-Divine, and thus against the very Will of Allah (Swt). and so the "Dunya" could only have been made manifest within creation by one source, the will of minds that are not in accordance with the will of Allah (swt), by the rebellious, by the Shayatiyn like "Ibliys" (Al-Shaytaan Al-Rajiym). where good is made to seem evil, and evil is made to be fairseeming, and this "Fairseeming" means "psychologically Pleasing", thus the Mind of man became a "lover of darkness", because he saw the darkness (igorance, jahaliyyah) as being "fairseeming". and it is the "Darkness" of "ignorance" that makes the mind "Un+Clean" (Insane), or "Dirty". notice that in the Book of Genesis, the first book of "Al-Tawrat" (meaning "The Torah"), it says when Adam fell he was now to Eat from the Dust of the Earth, and you are what you eat, mentally as well as physically. in this sense, the Jennati 'Adin (Garden of Eden) represents the Wisdom of Allah (swt) which built it, and the trees represent the different branches of "Wisdom" (Science) known to Allah (swt), and they were allowed to eat (learn = fill their minds) from every tree, but two, and when they left their Diyn, they were cast out into the "Dunya", which represents every place where the Divine is not. and in the "Dunya" they only had every lowly thought (dust) of Man (Earth) to eat (fill their minds) from. until finally, every thought of Man was evil continually. if you look at the positions of Salat, you see a small reinactment of the fall of man, he starts out standing (Qiyyam) in an upright (Haniyf) on his Diyn, but then before it is over his head is down in the Dust of the Earth praying for forgivness for his deeds. we call this "prostration" (sajdah), which is not a evil or bad thing, in fact, it is the highets form of showing respect, which is why the Angels were commanded to prostrate to Adam, Jibra'il (Gabriel) being the first to do so. but you can also see the symbol of starting out upright on two feet, like a man, and then ending up stretched out on all fours, like an animal. the Salat was not put into the order it is in for nothing, the order of the Salat tells a story, the story of going from being the ones prostrated to, to going to being the ones prostrating. and the end of Salat, also tells us how the story finishes, because what is the last thing you say "Al-Salamu Alaykum Wa Rahmatu Allah Wa Barakatuhu" to the Angel on your right, and then to the Angel on your left, and thus, you are sitting next to them, really in the middle, as ONE OF THEM, if you are a Moslem (Muslimiyn/Muslimuwn), as all of the Angels of Allah (swt) are Moslems (muslimiyn/muslimuwn), and Islam (Al-Islam) is also their Diyn. I always tell people that one of the reasons you say "Allahu Akbar" everytime you switch from one position in Salat to the next is to remind yourself, who it is that is really supposed to be in charge EVERY TIME you think, act or speak. and if Adam and Eve would have said "Allahu Akbar" before every single thought, deed and action, they probably would not have fallen out of their Diyn and off the Siratu Al-Mustaqiym in the first place. life in the Garden of Eden was their Natural Physical Way of life, and life in Al-Jennah is your Natural Divine Way of life. so, when you stay in your Diyn, you are staying in the Garden. 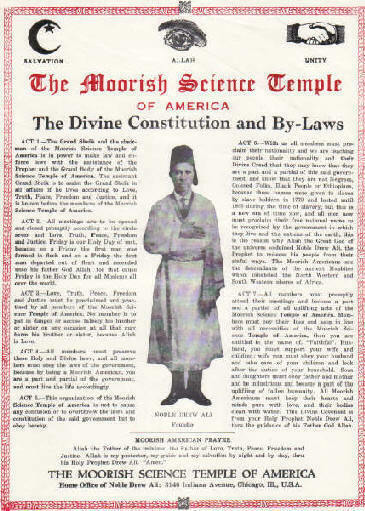 This site has been established for one purpose, and that is for the benfit of all of my "African" brothers and sisters, especially those in North America, Central America, and South America, so that they may receive an Moorish (African) understanding of True Islam (Al-Islam), free from all anti-African psychologies, views, perspectives, philosophies, etc. True Islam (Al-Islam) is a Pro-Human religion, and does not support any form of racism, egotism, supremacy, of one Racial, Ethnic or National Group over another when it comes to Islam, all Moslems are equals. thus it does not support White-Supremacy, or Black-Supremacy, it only supports the Human-Supremacy of all Moslems, as the point (Divine Plan) of Almighty God Allah (swt) in sending such a message to humanity (all human beings) is to make you into a Superior People of a Supreme Civilization, whose seed is the "Ummah". and after watching the mental, physical, spiritual, emotional, psychological and philosophical mistreatment of my African brothers and sisters by others claiming to be "Muslim", I feel it is now time for the Whole Divine Truth of True Islam (Al-Islam) to be given to them, so they can take their rightful place in the affairs of men, with the Divine Rights (ordinations) given to them by Almighty God Allah (swt). this site is not about "African-Supremacy", it is about African Equality with the Supreme (highest) State of Being, which all men of all nations, including our own people, deserve. and so, I desire nothing but the very best and better in everything we do, including our religion of Islam (Al-Islam).